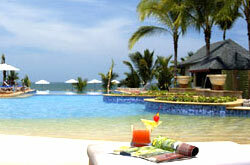 La Flora is a boutique resort featuring 70 rooms and villas. 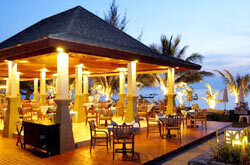 The resort is located on the mainland in Khao Lak about one hour North of Phuket International airport. 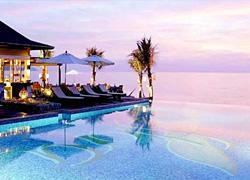 Location, modern design with casual polite service, are the main attractions of the boutique resort with it's beach frontage onto the Andaman Sea. Khao Lak is a microcosm of tropical wilderness and unspoiled nature along a 30-km stretch of the Andaman coast overlooked and bypassed by mainstream tourism, until recently, this ‘off-the-beaten track' destination has been the best kept secret among a handful of predominantly European world travelers in search of pristine nature and wide open spaces far away from the crowds and nightlife. Our facilities remain within the bounds of a small boutique style resort with our emphasis and focus on personalized friendly service. All villas and rooms are luxuriously appointed with all modern conveniences, including sets, access, mini bar with coffee and tea making Facilities, electronic safety box, individual air condition, IDD telephone and satellite TV. 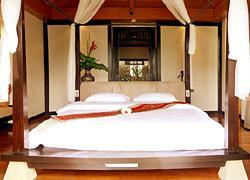 All Villas include a DVD entertainment set separate shower and bathtub and an outside rain shower in the court yard. Tour services which include, island day trips, sea canoeing, Mangrove Canoeing, elephant trekking, Jungle Walking, Bamboo Rafting, diving, snorkeling, nature walks. Room service, free internet use, free use of mountain bikes, free yoga instruction, Thai cooking classes, fruit carving classes. The Spa Laflora, located in the center of our tropical garden, offers a wide range of holistic programs to balance body, mind and spirit. 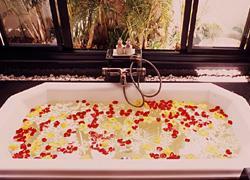 The Spa features: Herbal steam-bath, Reflexology center, Beauty salon, Meditation, Yoga and “Master in Residence”, Massages, Wraps, Scrubs and Facials. 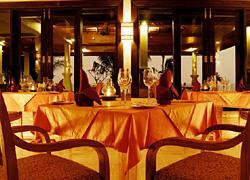 The light and thoughtfully appointed Deluxe Room cover an area of 41 Sq Meters. Space, functionality, and ease of living were the design objectives of these rooms, each with private bathroom, shower, modern decoration and amenities. A day bed and a balcony for relaxing finish the room. 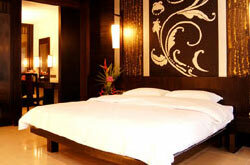 The Deluxe Studio rooms are 48 Sq Meters. The design driven rooms transfer space into art with creative use of space colours and materials without the loss of functionality. 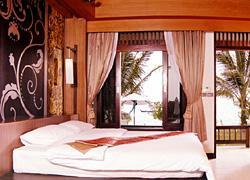 Each Deluxe Studio features a large day bed which can be used for at least two children. 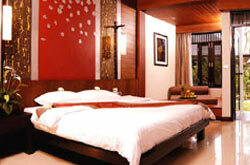 The courtyard rooms are all on the ground floor giving additional peace of mind if you are traveling as a family. Stylish bathrooms with private shower and toilet complete the room. Sea View Villa's use of space, furniture and ambiance has created a comfortable and practical environment to relax and enjoy it's pristine location. Modern Asian ideas including the Balinese outside rain shower, sunken bath, and special amenities make the bathroom a sensual place to stay, while the living area, with it's writing desk, day bed, DVD sound system, contemporary bed configuration, and individual wall paintings complete the ambiance. 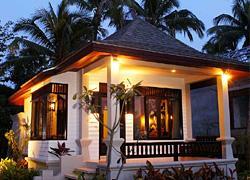 The Jacuzzi Villa covers an area of 150 Sq M and is designed for a family or group of guests. Two bedrooms and one shared living room are surrounded by a large deck area with a Jacuzzi. The master bedroom houses a four poster double bed with on suite bathroom, an outside rain shower, sunken bath and changing area. The second bedroom features a twin beds, with on suite bathroom decorated in the same style, with a unique wall painting relaxing decor. The lounge has an area for watching DVD's or satellite TV with small kitchenette.